When they first set out to follow grey reef sharks around the Republic of the Marshall Islands (RMI), Darcy Bradley and her colleagues intended to survey their movement in the protected waters there. What they found was a disturbing development for the Pacific island nation. "It's not the study we expected," said Bradley, a postdoctoral researcher at UC Santa Barbaras's Marine Science Institute and at its Bren School of Environmental Science & Management. "Instead, we uncovered a high level of illegal shark fishing from within the Marshall Islands shark sanctuary." Indeed, of the 15 adult grey reef sharks they satellite tagged to follow around the Marshall Islands' Exclusive Economic Zone—roughly 2 million square kilometers of which has been declared a safe haven for sharks—eight were suspected of having been illegally fished from the RMI "shark sanctuary." "There was nothing 'sharky' about the movement patterns we were tracking," Bradley said. Instead of staying relatively close to shore, the tags had moved thousands of kilometers across the Pacific Ocean at speeds much faster than a reef shark is able to sustain, she explained. Some tags even ended up in local ports in both Guam and the Philippines. It was a worrisome situation, according to the researchers, especially since RMI in 2011 adopted sweeping protections for its sharks—becoming among the first in the world to do so. Based on this recent incident, if the observed rate at which the sharks were captured (and presumably killed) were to occur over a large spatial area, the researchers estimated that even a healthy population would collapse to less than 10 percent of its unfished state in fewer than five years. The group's paper, "Leveraging satellite technology to create true shark sanctuaries" is published in the journal Conservation Letters. Despite the good intentions and expansive protections for sharks in the RMI sanctuary area, as well as the high risk involved in illegal shark fishing, the high value of these sharks—both commercial and black market—may have proved too tempting for those who engaged in the suspected illegal shark fishing event. The incident also verified a notion many marine conservationists have held for a while: For an area to be a "true" shark sanctuary, active monitoring and enforcement need to be part of the system. "A 'shark sanctuary' is not a no-take marine protected area," Bradley pointed out. "It is an area that bans the commercial fishing of sharks specifically." Industrial fisheries almost always operate within the borders of shark sanctuaries, and multiple countries fishing in these areas are expected to comply with the no-shark rule. However, Bradley continued, monitoring and enforcement are currently the sole responsibility of the host nation. For countries such as RMI with vast and remote ocean territories and limited resources to develop and support monitoring and enforcement protocols, that means it is lucrative and relatively easy for fishers to fly under the radar and target sharks for commercial and black market sales. "Nearly all parts of the animal can be sold: meat, cartilage, liver, leather and of course fins, which can sell for hundreds of U.S. dollars per kilogram," Bradley said. Enter satellite technology. Thanks to existing and emerging satellite-based technologies, such as vessel tracking systems and automatic identification systems—already in use for purposes of collision avoidance, navigation and maritime security—the researchers contend that it is possible to track fishing vessels over a large swath of ocean at a relatively low cost compared to traditional on-the-water, from-the-air or land-based methods. And the benefits would extend beyond protections for sharks. "The ability to 'see' all boats in all places in near real-time using satellite tracking technology would provide a means to monitor for compliance with multiple fisheries management goals—be they combatting illegal fishing, monitoring transshipments, identifying fishing activity in high bycatch areas and more," Bradley said. 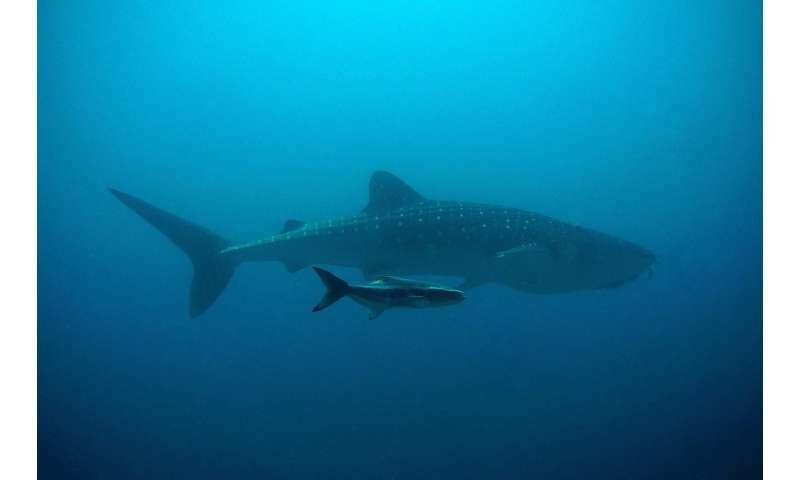 The data sharing capabilities enabled by these systems also could improve the agreements between sanctuary nations and entities that fish in their waters—an important element in the successful enforcement of fishing regulations for sharks and other protected species. Satellite identification and monitoring of vessels known to have engaged in illegal fishing could curtail such activity, as the technology could track vessels through a unique identifying number that persists despite any attempts to change the vessel name, flag or ownership. The researchers also recommend partnerships between international groups, stakeholder nations, nonprofit and private sector entities, and local-level participants to find consensus, adopt strategies and advance policies that would result in more effective shark sanctuaries. Nearly a quarter of all shark populations are threatened with extinction, and fishing is largely to blame, Bradley said. Shark sanctuaries serve to provide blanket protection for all sharks as a potentially less complex way to combat shark overfishing. "But for the shark sanctuary model to work, we need to think creatively about ways to closely monitor all fishing activities within sanctuary borders," Bradley said. "Currently, we have the technology to make this happen, we just lack the buy-in."